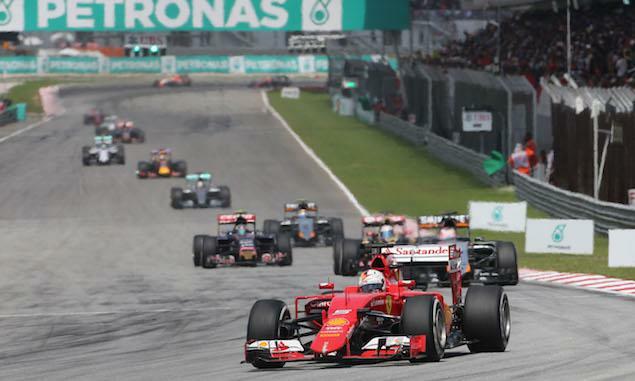 Se bastian Vettel has won the 2015 Malaysian Grand Prix at the Sepang International Circuit. After the season opening round in Australia, many surmised that Mercedes would dominate this year’s world championship as they did last year, but Ferrari have injected serious doubt into this after seemingly having more than enough pace to challenge and beat the reigning champions today. Lewis Hamilton had taken the pole position, but he had to settle for second after a frustrating race, with team-mate Nico Rosberg completing the podium. Max Verstappen made history after becoming the youngest driver to score world championship points after finishing 7th at only 17 years old. Manor F1 team also have cause to celebrate after Roberto Merhi drove his #98 car home in 15th place. Lewis Hamilton had a great start as the lights went out. He won the drag race down into the first turn, with Rosberg briefly jumping Vettel before the Ferrari driver took the position back on the brakes. Marcus Ericsson had made some gains in the first few laps after his best qualifying of his career. However it was almost a case of ‘hero to zero’ after he took too much speed into turn 1 on lap 4 before beaching his car in the gravel. This bought out an early safety car. A number of drivers, along with the two Mercedes team-mates, elected to come into the pits under the safety car, but Vettel, Hulkenberg, Grosjean, Sainz and Perez decided to stay out. This meant that they were in the top 5 when the safety car came in. Hamilton and Rosberg restarted 6th and 9th respectively and needed to make up ground quickly. This wouldn’t be as easy as it was expected however, as they were the only two drivers in the top 10 on the slower tyre compound. Hamilton charged through the pack and reached the 2nd place spot by lap 10. By this time however, Vettel was almost 10 seconds up the road in the lead of the race. Rosberg soon worked himself back up into 3rd by lap 15. Mercedes didn’t seem to be catching Vettel at the rate that some might have thought. It wasn’t until Vettel pitted for the first time on lap 18 that Hamilton took the lead back. After a miserable Melbourne for the Ferrari pit-crew – which saw two horrible pit-stops for Kimi Raikkonen – the Ferrari team must’ve been holding their breath, but the crew’s practices in the build-up to the race paid off as they serviced him in 2.5 seconds. Vettel re-emerged on the faster tyre as opposed to the Mercedes drivers on the hard compound. Rosberg’s engineer warned him that Vettel may push him, and push him he did. Nico was unable to fight off Vettel for second, with the German pulling off a move up the inside into the final hairpin just 3 laps later. Another 3 laps passed and in that time Vettel had the gap back to Hamilton once more, with Sebastian all over his gearbox before Lewis pitted for a second time. Rosberg followed his team-mate into the pits a lap later, but the team fitted his car with the hard tyre; the opposite tyre to that on Hamilton’s car. With Vettel taking the lead at the front of the field, his former team of Red Bull were struggling in the middle. Toro Rosso’s teenage sensation Max Verstappen pulled off a scintillating around the outside of the Red Bull of Ricciardo at turn 1. Ricciardo held his ground, but Verstappen had the inside line for turn 2 and duly took 10th; a great statement for the junior team driver to pass the senior team’s 2014 race winner. Problems continued for the Red Bull team on lap 27. Daniil Kvyat briefly managed to pass his team-mate at turn 1, but he then seemed to turn across the front of Nico Hulkenberg’s Force India. The contact briefly threw the Red Bull off the ground and into a spin, but Kvyat was able to get the car back on-track. Although the blame seemed to lie in the hands of Kvyat, the stewards felt otherwise. Nico Hulkenberg received a rather harsh 10 second stop and go penalty for the collision. The sister Force India of Sergio Perez received the same penalty a few laps later after contact with Romain Grosjean. The Lotus driver had tried a move in the fast, sweeping turn in the final sector but the pair touched, sending Romain into a complete 360 spin. Back at the front of the pack, the gap between Vettel and Hamilton was in the region of 14 seconds; a big lead for the Ferrari driver. However, he did have to pit for a final time. He came in for his second and last stop on lap 37 for the hard tyres that he had yet to run. 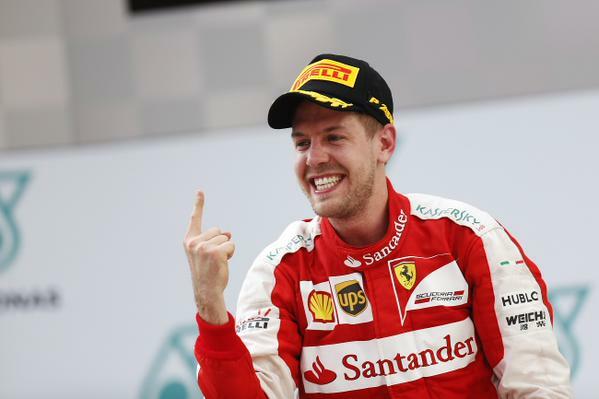 Hamilton took the lead, but Vettel managed to re-join ahead of the second Silver Arrow of Rosberg. Hamilton didn’t hold the lead for long however, as he came into the pits for his last stop 2 laps later. The team put the hard tyres onto his car, which Hamilton questioned as he believed it was the wrong choice. The team had no other choice in fact, as their only other set of the faster medium tyre had been through significant running in qualifying yesterday. Hamilton’s team-mate was able to pit for the preferred tyre a few laps later, with Rosberg being fitted with the medium compound with 14 laps remaining. He had the tyres to possibly catch his team-mate who was 10 seconds ahead, but the pace never materialised. Similarly, Hamilton didn’t seem to have the pace to catch the Ferrari in the lead, with the gap remaining around 10 seconds for the final few laps. So after a dominant performance in the first race of the season, we’d all thought Mercedes had a clear and distinct advantage. Such was the gap that both Hamilton and Rosberg commented that they wanted Ferrari to catch up and challenge them. Perhaps they spoke too soon as on lap 56, Sebastian Vettel weaved his way across the line to take his first victory since the 2013 Brazilian Grand Prix, his first win for Scuderia Ferrari and the team’s first win since the 2013 Chinese Grand Prix. It could be argued that the only time Mercedes were beaten last year was when their cars had been in trouble, but this time it seemed that they had been beaten fair and square. Lewis Hamilton brought his car home for second, with team-mate Rosberg completing the podium in 3rd. Kimi Raikkonen had endured a tough Grand Prix. He received a puncture right at the beginning of the race which put him at the back of the field. Despite this, he used the impressive pace that had seen his team-mate take the win to charge through the field to take a brilliant 4th pace; further outlining that Ferrari could bring the fight to Mercedes this year. The two Williams drivers duelled in the final laps, with the returning Valtteri Bottas pullling off a daring move around the outside of turn 5 on the penultimate lap to take 5th from Felipe Massa. Behind them came the youngest driver ever to finish in the points in Formula One. 17 year old Max Verstappen pulled off a great drive to take 7th place and 6 championship points. His team-mate and fellow rookie Carlos Sainz took his second points finish in a row in 8th place. The two Toro Rosso drivers were followed by their senior team compatriots Daniil Kvyat and Daniel Ricciardo, who took the final two points paying positions. It was a great day for Manor Marussia, with Roberto Merhi completing his first Formula One race in 15th. His team-mate Will Stevens was unable to race after further fuel problems hit his #28 car, but the team will be encouraged after completing their first race of the season. 5 drivers failed to finish the race, with Pastor Maldonado once again failing to finish the Malaysian Grand Prix having never succeeded. Both McLaren’s failed to finish the race for the first time since the 2006 United States Grand Prix. Jenson Button retired with a turbo-related issue, with Fernando Alonso failing to finish his first race of 2015 after an ERS problem. The final in-race retirement was Marcus Ericsson on lap 4, with Will Stevens failing to start the race for Manor. The next race of the season takes place in 2 weeks time, with Lewis Hamilton heading to the Chinese Grand Prix at the Shanghai International circuit in the lead of the championship ahead of today’s race winner Sebastian Vettel and Nico Rosberg. Mercedes lead the constructors championship ahead of their new rivals Ferrari.